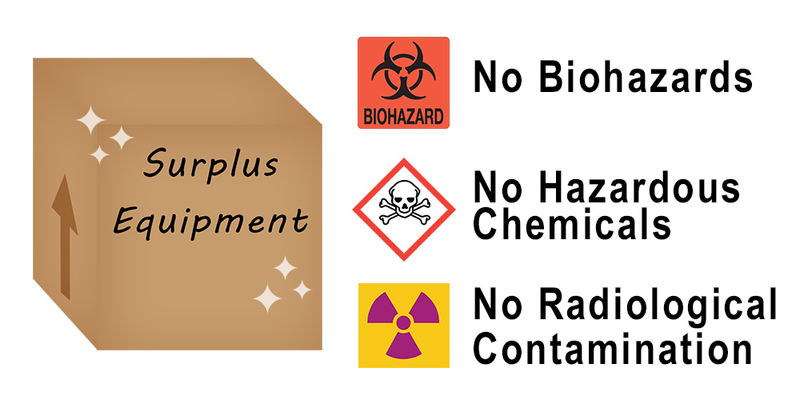 Equipment that is destined for surplus must be properly decontaminated from chemical, biological, or radiological hazards. Surplus equipment is managed by UT Warehousing Services. We ask you to bear in mind that the surplus warehouse workers have no special knowledge about laboratory practices and potential contaminants. When they receive something from a lab that looks dirty, they must assume a hazardous contaminant. These items going to surplus, if not purchased by another department on campus, are auctioned off to the general public, so items must be cleaned out and decontaminated by lab personnel so that no one is unintentionally harmed. What might the equipment be contaminated with? Wear appropriate PPE (disposable nitrile gloves, safety glasses or goggles, lab coat) during decontamination and spill clean-up. All containers (samples, etc.) must be removed before decontamination of equipment begins. Clean up all spills in or on the equipment prior to decontaminating (spill clean-up materials may need to be disposed of as hazardous waste or biohazardous waste, or radiological waste as appropriate. Contact the appropriate safety office for assistance with this. Determine if the design, materials, or construction of the equipment will have an effect on the decontamination process. Crevices, joints and pores constitute barriers to the penetration of liquid disinfectants and prolonged contact time may be required to accomplish decontamination, depending on the intricacy of the design and the amount of soil present. Select the appropriate disinfectant or decontamination solution depending on the contaminant. When incubators, refrigerators, freezers or other equipment are disinfected, they should also be wiped out and dried out completely. Also, the doors should be left open, if possible, to prevent mold growth. For specific guidance on how to disinfect an item with biological contamination, please contact the Biosafety Office at 865-974-5547 or utbiosafety@utk.edu. Mercury containing items should not be sent to surplus. The mercury should be disposed of as hazardous waste. For specific guidance on chemical decontamination of equipment, please contact EHS at 865-974-5084 or ehs_labsafety@utk.edu.